InFocus Corporation announces a new line of Mondopad collaborative display solutions. Comprising 12 models designed around the needs and budgets of various office environments and meeting spaces, Mondopad Core, Mondopad Launch, and Mondopad Ultra are available in 55-inch, 65-inch, 75-inch and 86-inch models. The new Mondopad line includes a suite of collaboration features to make meetings and lessons more productive. Each tier of the new line has features specific to various use cases and environments, but all 12 models are based on an easy-to-use touchscreen collaborative system with digital whiteboard, wireless casting for document, photo and video viewing and annotation, and the ability to browse the web. 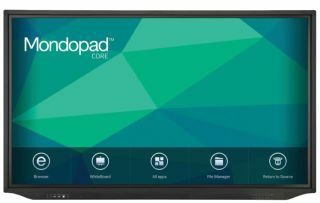 Mondopad Core is the affordable baseline of the new Mondopad. Users can utilize the 4K business-grade touchscreen with embedded Android and a suite of tools for casting, whiteboarding, viewing documents, and browsing the web. Mondopad Core also lets users view and present documents, photos, and videos, and annotate and save changes in real time. During brainstorming sessions, users can launch the interactive whiteboard and write or draw on a giant multi-screen canvas. Designed for organizations that need easy access to shared software and tools, such as video conferencing services, presentation apps and project management software, Mondopad Launch is a configurable solution for group workspaces. Building upon the Mondopad Core model, Mondopad Launch adds a seventh generation Intel i5-based Windows 10 Pro PC and additional customization options. A lock-down feature allows individual users to login and quickly gain access to only the apps they care about. A video conferencing-ready platform, Mondopad Launch includes a 4K camera for collaboration and effective face-to-face meetings. Built on a seventh generation Intel i7-based Windows 10 Pro PC, Mondopad Ultra features an integrated suite of collaboration apps including video conferencing, whiteboarding, casting, a web browser, and full Microsoft Office suite. Mondopad Ultra offers a complete video conferencing platform including a 4K camera, microphone, and wireless keyboard with integrated touchpad, plus ConX Cloud video conferencing subscription. When signed onto ConX Cloud or any other video conferencing solution, users in various locations can also launch ConX Whiteboard to interact and share ideas on a Mondopad Ultra whiteboard simultaneously.